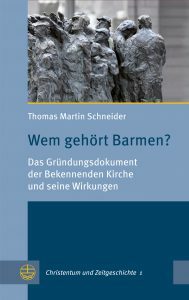 Review of Thomas Martin Schneider, Wem gehört Barmen? Das Gründungsdokument der Bekennenden Kirche und seine Wirkungen (Leipzig: Evangelische Verlagsanstalt, 2017). Pp.241. ISBN: 9783374050345. This review was originally published in zeitzeichen. Evangelische Kommentare zu Religion und Gesellschaft, February, 2018. https://www.zeitzeichen.net/rezensionen/thomas-martin-schneider-wem-gehoert-barmen/. It is reprinted in translation with the permission of the publisher. The Barmen Theological Declaration (BTD), adopted on May 31, 1934, at the First Reich Confessing Synod in Wuppertal-Barmen, is widely regarded as the Magna Carta of the church opposition in the Third Reich. It is certainly rightly considered the most demanding statement of the Confessing Church (BK) in its defense against the advance of pro-Nazi German Christians (DC). The purpose of the DC was to transform the Protestant churches into a Reich church shaped by völkisch antisemitic theology and governed from Berlin according to the “Führer principle.” Much has been written about the theological content of the six Barmen theses in the postwar era, culminating in the 50th anniversary of the declaration in 1984. For anyone looking for quick information about this Protestant document of the century, about its historical context, about its theological meaning and its church-political significance, and about its enormously broad reception history since 1945, this popular overview can certainly be recommended. The reception of the Barmen Declaration is presented in particular detail, and its astounding variety makes it clear that various political orientations and church circles from the left to conservative evangelical groups felt that they could invoke the tradition and intention of the declaration in their current concerns. Almost all parties and groups declared sometime after 1945 that the good “spirit of Barmen” actually belonged to them and would be further developed in their work. An extensive documentary section (p.155-219) documents the diverse uses of the declaration by everyone from Marxist GDR theologians to West German Left-Protestants to the Christian Democratic Union (CDU) and Evangelicals. It is noteworthy from today’s point of view that the Lutheran churches which were abstinent and critical of the Barmen Declaration during the time of the Church Struggle—they sensed too much Reformed spirit in the statement which was largely formulated by Karl Barth—have since 2012 (after a long period of reflection, beginning with the newly-founded North Church) begun to refer explicitly to the theological and church-political traditions of Barmen. In this account by the Koblenz-Landau church historian, one can not ignore the remarkably sympathetic treatment (for example, pp. 62 f., 72 ff.) of the Lutheran churches which adapted to the Nazi regime and which were skeptical or even hostile to the Barmen project from the outset. From today’s point of view, a critical church-historical assessment would seem more appropriate. Also, an up-to-date church history should leave behind terms from the time of the Church Struggle such as “intact” and “destroyed” churches. For the three large Lutheran regional churches (especially that of Hanover), with their far-reaching adjustment to the regime, the label “intact” should really be dispensed with. And for divided regional churches, such as the great Old Prussian Union Church, it would be more appropriate to speak of “self-destruction.” Although the author deals comparatively with the “Altona Confession” (1932), he deals too briefly or not at all with the 1936 memorandum of the 2nd Provisional Church Leadership (of the Confessing Church) to Hitler or the memoranda by Margarete Meusel (1935) and Elisabeth Schmitz (1935/36) on behalf of Protestant “non-Aryans” and persecuted Jews. A comparative chapter involving these and other important manifestations of the period of the Church Struggle would be well placed here. Nevertheless, on the whole, these restrictive remarks do not substantially reduce the great usefulness of this compact introduction to the most important Protestant church document of twentieth-century German history.